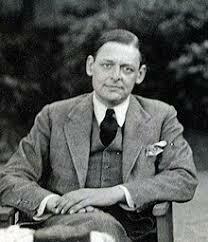 Thomas Sterns Eliot (1888-1965) was born in St. Louis, Missouri and migrated to England at the age of 25. As did the American novelist Henry James, he became a British subject very much influenced by the European milieu of his adoption. As his biographer Peter Ackroyd points out, while a student at Harvard University studying for his Master’s Degree, Eliot took courses with two great scholars: the philosopher George Santayana, who did not recognize in Eliot a budding genius; and the humanist pioneer Irving Babbitt, who did. Babbitt reinforced Eliot’s inbred preference for the classical rather than the romantic stream of literature, a reinforcement that was abetted by Eliot’s decision to move to England, where polite reserve ruled rather than the robust and romantic extravagance of the American psyche. G.K. Chesterton, something of a romantic himself, wryly commented on Eliot’s writing style: “Indeed, when he does make an epigram (and a very good one) he is so ashamed of it that he hides it at the end of a minute footnote, for fear some critic or other should accuse him of brilliancy.” Even so, Eliot’s brilliance as poet, playwright, and essayist was fully acknowledged when he won the Nobel Prize for Literature in 1948. There is every reason to believe that Eliot’s conversion was sincere and a source of inspiration for his later writings on religion and society. Eliot had traversed the dark night of his own soul. Whereas once he had eloquently written of the Age of Anxiety into which he was born, “This is the way the world ends / Not with a bang but a whimper,” now he could write of the divine Light at the end of the tunnel, the light to be worship-fully followed; and he did so immediately with his first Christian poem, “Journey of the Magi.” In another of his best religious poems, “Ash Wednesday,” written three years after his conversion, the themes of penitence and renunciation are explored, and Eliot speaks mystically of the Word unheard. In so few words Eliot has summed up the whole impulse of modernity, the great reason why the “Word is unspoken, unheard” concerning religion: Indifference. He does not offer an explanation for that indifference, but one that comes to mind is the natural human tendency toward spiritual entropy (laziness) identified by psychologist M. Scott Peck in his fascinating book The Road Less Traveled. That is, humans like to take the path more traveled because it offers the least resistance; whereas the path of religion, more resisting, offers many hills to climb and many paths to clear for those who choose it. On Pascal, Eliot reflects: “But I can think of no Christian writer, not Newman even, more to be commended than Pascal to those who doubt, but who have the mind to conceive, and the sensibility to feel, the disorder, the futility, the meaninglessness, the mystery of life and suffering, and who can only find peace through a satisfaction of the whole being.” The “whole being” to which Eliot refers must be not only the reasons of the head required by the thinker, but also the reasons of the heart demanded by the poet, the Christian poet that Eliot had become once he had discovered that his whole being was crying out for some believable explanation of the mysteries as opposed to no explanation at all. Had Eliot lived in our time, he would see even more clearly the collapse of liberalism; some public colleges, once famous bastions of free inquiry and dialogue, have become hellish regimes of autocratic faculty daily daring students to utter speech remotely hinting at conservative values. The present scene in academia (which I used to inhabit) is now more anarchic and explosive than ever before. But the abuse of free thought and free speech is not limited to the academy. Also rife throughout the mainstream media are recent attempts to stifle coverage of free speech that is critical of political correctness, not to mention promoting “fake news” that manipulates the public like Pavlov’s dog. This once Christian civilization, Eliot says, does not realize how far it has drifted into paganism over the recent centuries. The Christian accommodation to industrial materialism has been slow but constant, so much so that the Christian need not be persecuted by the pagans because he is not perceived to be an enemy so much as a minority customer to be tolerated and exploited. But this could be fatal for Christianity. “I am concerned with the dangers to the tolerated minority; and in the modern world, it may turn out that the most intolerable thing for Christians is to be tolerated.” After all, Eliot might have added, was it not the intolerance of the Romans and the blood of the martyrs that spurred the rise of Christianity? In his Notes Toward the Definition of Culture (1948) Eliot begins by exploring the evolution of simple cultures into complex ones. At first all the functions of an early tribe, appearing in all their simplicity, are interwoven and almost indistinguishable. But as the tribe grows into a civilization the various functions – religion, crafts, science, politics, etc. – become more competitive with each other for dominance in and over the minds of the citizens. The evolution of a culture is by stages, which means that certain functions may dominate one era but be replaced by the dominance of other functions in the next era. Thus we see the primitive language of drums and horns appear at an earlier stage, and symphonic music at a later stage. Simple religion dominates in the early stage, and is significantly challenged by complex theologies in a later era. Noticing this change through history encourages the idea of progress, that the later stage is an improvement over the earlier one. However, progress can turn to regress given the right conditions. The present is not necessarily better than the past, and the future is not necessarily better than the present. A monarchy can turn into a democracy, but a democracy can turn into a mobocracy, and a mobocracy into a dictatorship, as the history of France showed from the Revolution through to the ascendancy of Napoleon. Therefore it seems that all so-called progress is subject to perilous adventures. Whereas in the early phase of a civilization the different functions of a society that support each other may for a time do so, in the later phase they may cease to do so for one reason or another. The great physicist Isaac Newton could see God’s intelligent designing power just in the existence of the human thumb. But there is no doubt that, since Darwin at least, a certain generalized tension has come to exist in western society between religion and science. That tension is accompanied by yet another tension, the one between religion and the arts. In a post-Christian society, one can successfully predict the arts coming into the service of anti-religious forces. In light of recent artists’ paintings and sculptures that are virtually blasphemous against Jesus and Mary (proving the hate-filled vulgarization of the culture) Eliot anticipated in 1948 what we have more recently witnessed. Thus, he asserts, “Religious thought and practice, philosophy and art, all tend to become isolated areas cultivated by groups in no communication with each other. The artistic sensibility is impoverished by its divorce from the religious sensibility, the religious by its separation from the artistic.” But the ramifications for the entire culture are clear: without art and religion serving each other, as they so well did in the Middle Ages, how will people know what their own values are, and how will they learn to celebrate how beautiful and precious those values are? The spiritual malaise of western cultures cannot help but to produce by-products evident to anyone who is willing to see them. The post-Christian era has produced an emptiness of soul that is over-compensated for by the national rush toward physical obesity. Eliot puts it this way: “If we take culture seriously, we see that a people does not need merely enough to eat … but a proper and particular cuisine: one symptom of the decline of culture in Britain is indifference to the art of preparing food.” Not only indifference to the art of preparing food, but to the kinds of food eaten … high caloric and fat diets. Statistics prove that obesity exists among 35 percent of Americans, and the numbers are predicted to get substantially higher in decades to come. The question concerns not just how much people are eating, but what kind of foods they crave. The phenomenal growth of the fast-food industry shows that one of the Christian’s deadly sins, gluttony, has become epidemic and is greatly contributing to the physical decay of citizens along with provoking the spiritual malaise of tens of millions. Eliot goes on to insist that religion is not just one element of a culture, but that it is an essential element. Notice that the decline of the Roman Empire was contemporary with the decline of the pagan religions. Notice too that the re-invigoration of the West only came very slowly with the arrival of Constantine and Charlemagne, both champions for Christianity as the official religion of Europe. One feature of that religion is that, through the Catholic Church, it unified Europe in a way that no other religion had. Whereas two or more moral codes could exist in other cultures (such as one for the rich and one for the poor in Hinduism) Christianity had taught that rich and poor were equally accountable to the same God. Christianity also taught that not only infallible dogmas could be preached, but that they could be defended against a robust skepticism. Anyone who doubts this should read Aquinas, who artfully replies to all the doubts one could raise against religion. But Christianity, while honoring skepticism by answering it, refuses to honor pyrrhonism (doubting the existence of truth itself). If there is any culture in which pyrrhonism has triumphed to the extent of creating a nearly universal psychological derangement, it is the present one. While watching the evening news on television, one often has to doubt either the truth of what is reported or else concede the general insanity of the world around us. Eliot believed that a universal religion would be the religion that would unify morals everywhere. But in a culture with diverse religions competing, or religions competing with widespread atheism, such as our own, the world would have a more difficult time promoting positive moral conduct. Moral anarchy exists when no universal religion can impose its morals on the general populace, or when there is no religion at all to impose a unified morality. For example, the unified morality of North Korea (such as it is) stems from the evil genius of a dictator, and from nowhere else. But this tyrant is not a distant God who withholds judgment until the end, and therefore we expect public and private submission to the will of one man who rules with the iron fist. If that one man is lunatic (we have seen this more than once in the last century) the whole nation will become a lunatic asylum to appease him or else die by his command. As Eliot says, “When we consider the problem of evangelizing, of the development of a Christian society, we have reason to quail.” We have considerably more reason to quail now than when Eliot wrote that sentence seventy years ago. In Eliot’s day mass shootings were almost unheard of. In recent years they have become common, one of the most recent being the mass murder of Christians inside their own church in Sutherland, Texas. Before that was the mass shooting incident in an Oregon school where the shooter asked his victims if they were Christians, and if they replied yes, they were shot in the head. Anyone who looks into the matter can see that in general the media reports mainly negative news, or no news at all, regarding significant developments in the world of religion. Both in the movies and television there is no lack of criticism and mockery of Christian leaders and teachings. Recently a candidate for appointment to a federal judgeship was interviewed by members of Congress. When asked her views on abortion, she was virtually indicted as suspect because she was Catholic. If the open warfare on Christianity has not already begun, the hints that such a war is imminent are not difficult to find. For Eliot, evangelizing is the key to the survival not only of Christianity, but of the civilization Christianity has shaped through the centuries. “The Church is not merely for the elect – in other words, those whose temperament brings them to that belief and that behavior. Nor does it allow us to be Christian in some social relations and non-Christian in others. It wants everybody, and it wants each individual as a whole. It therefore must struggle for a condition of society which will give the maximum of opportunity for us to lead wholly Christian lives, and the maximum of opportunity for others to become Christians.” Recent popes have agreed with Eliot about the desperate need for universal evangelizing. Yet it has been offered that evangelizing needs to begin inside the Catholic Church which has been splintering itself into opposing liberal and orthodox camps, much as modern Protestantism has done. Catholicism must return to the orthodox unity it once possessed if it is to unite the world by its example. Various attempts to accommodate the non-Christian world can only result in the end with accommodating various devils. Is there no way out of this dilemma? Eliot offers a definite and do-able one by hearkening back to the early Christian Fathers who had to survive and toil to make Christianity prosper in a dominantly pagan world. “We need to see the world as the Christian Fathers saw it; and the purpose of re-ascending to origins is that we should be able to return, with greater spiritual knowledge, to our own situation. We need to recover the sense of religious fear, so that it can be overcome by religious hope.” We may infer from Eliot’s remarks that budding young theologians worth their salt could intelligently survey the writings of the early Fathers and extract from them the necessary policies and procedures that will put orthodox Christianity back on its feet. In other words, if by the inspiration of the Holy Spirit it (orthodoxy) could be established once against all odds, there is every reason to believe that it can and will return to its place in the sun. For those who blithely think the loss of Christianity will be no great loss to the world, Eliot has some profound cautionary advice. “If Christianity goes, the whole of our culture goes. Then you must start painfully again, and you cannot put on a new culture ready made. You must pass through many centuries of barbarism. You must wait for the grass to grow to feed the sheep to give the wool out of which your new coat will be made.” Anyone who believes that a whole new mythology must be created to supplant the story of Christ’s mission, and a new morality must be found to replace his, will have to reckon with the State imposition of such a mythology and morality. We may suspect, based on our observations and experience, how well a State imposed super-mythology and morality is likely to work. For anyone who as yet has no such suspicion, a brief visit to Animal Farm by George Orwell may supply them with one. Merely because it ceases to be true? Is due to truths being in and out of favor. Next articlePatching the Chinese Schism?